This article is a short introduction of our brand-new product. It's a super simple workflow engine. Our workflow engine is database driven and can be configured and extended for your needs. The engine itself contains a simple board which allows you to create workflows. The configuration will be read from and saved into a database. The workflow steps are configured in the database and the engine simply executes the configured steps. We tried to find a workflow solution for our needs or a simple product which supports drawing workflows. We found a lot of complex workflow engines and tools but not a simple one. We didn't like complex solutions so we started with our own workflow enigne. 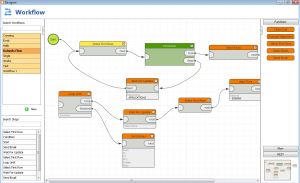 The left area contains the list of available workflows and all used steps for each workflow. 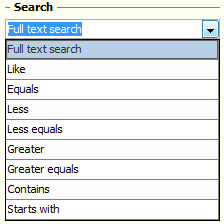 The search option is a full-text search for workflows and contained steps. The right area contains all available/configured steps. The steps are configured in a database. 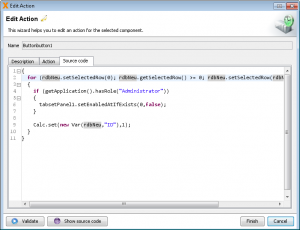 We offer a simple Java interface which makes it possible to implement your own workflow steps. The area also contains a mini version of the board. This makes it smooth to search through the workflow. The middle area, the board, contains the workflow designer. It supports Drag and Drop. 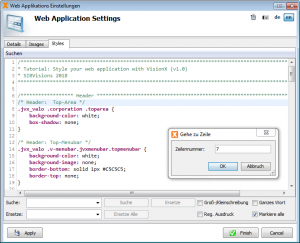 The created workflows can be used from any JVx based application. With next VisionX release, it'll be possible to use the new workflow engine. 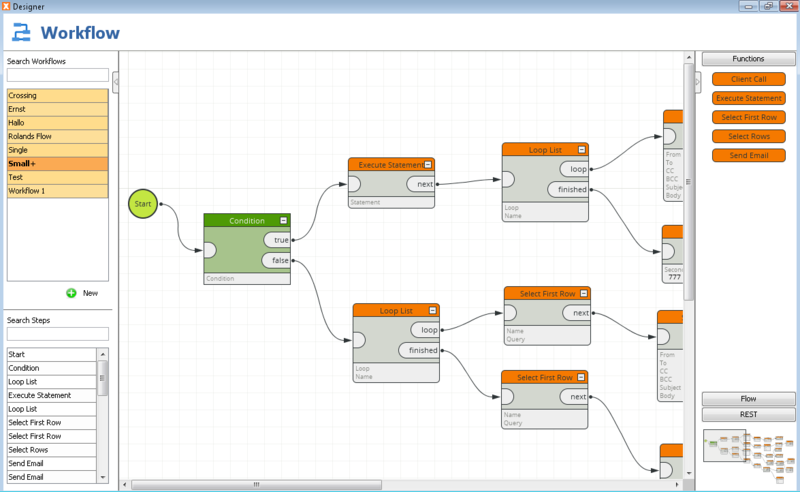 The workflow engine will be available as AddOn for VisionX and as standalone version for product bundeling. It's a company and a really cool platform for mobile application development. 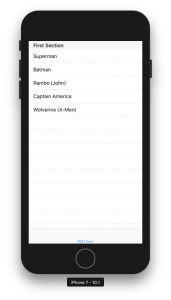 It enables you to use one codebase for iOS and Android. Since 2016, it's more or less free for everyone. We tried Xamarin some years before 2016 and it wasn't free. So it wasn't an option for us. Not because it's using C# as programming language. We already have mobile clients for JVx applications but they don't share the same codebase. There is one client for Android and another one for iOS. The source code is licensed under Apache 2.0. Our native clients work great but we think they could be better. In the last days we made some tests with different tools, to create a new universal client with one technology. A HTML5 client wasn't an option for us because of different criterias. A real native client was important during our evaluation. Sure, there's Gluon and some other individual developers, but the overall performance isn't relly comparable to native apps. It's awesome what happened in the last years, but the progress is missing. We still have our JavaFX based UI, but we're not sure if JavaFX will survive or it will be commercialized. So it's better to have an option. It's a really cool technology and works great with some smaller performance glitches (simply try the current KitchenSink from the App stores).. The cloud build isn't what we prefer and the pricing is not good for our use-case. Our client should be free, open and easy to use for every developer. Here is a simple test application for REST access to our Heroes application, used in our Angular test application. It's an awesome version with so many new features and new possibilities. We had some hard months but now it's done and it's available for everyone. We made the decision to wait a little bit longer with VisionX 5 because of changes in used frameworks. The new Version is more web centric than any version before, but it's not a web tool. VisionX 5 still supports Desktop application creation. All new applications will contain an empty application.css. 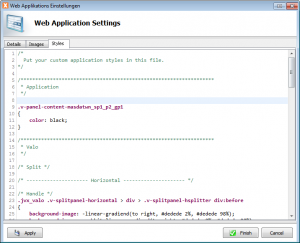 This file could be used to add custom HTLM5 application styles. 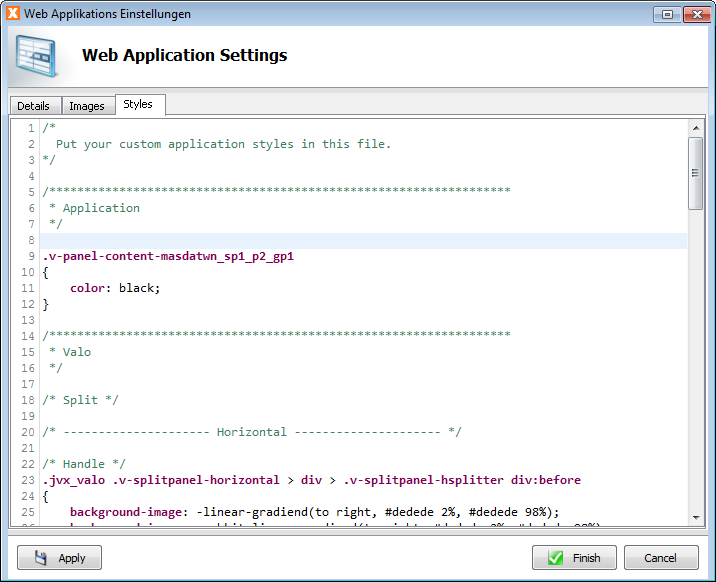 The new CSS editor makes it possible to change the style of the application directly within VisionX. The Editor supports Search/Replace/Goto line. It's also supported to reload the application in the browser. Simply test your style changes immediately. 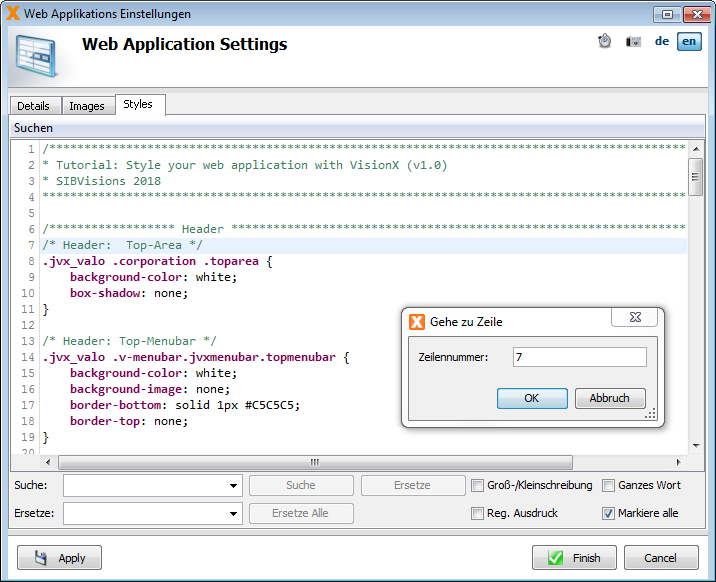 Newly created applications will use the new default theme "valo" as standard theme. 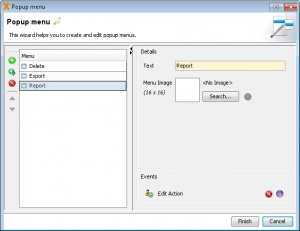 It's possible to change the theme in web settings wizard. The page navigation is now enabled by default. It support Back/Forward Browser navigation for the application. 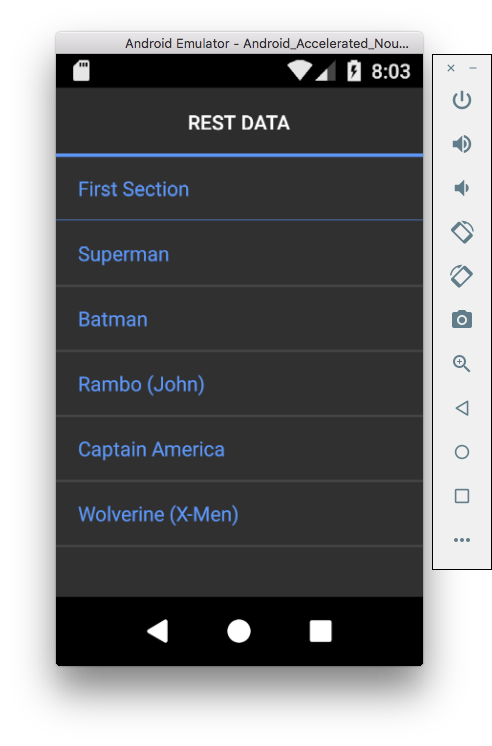 It's also possible to enable tabset navigation. This feature enables Back/Forward navigation for tab sheets. This feature is disabled by default. It can be found in the web settings. It wasn't easy to change the favicon for your application because it is stored in different locations. VisionX 5 solves this problem because it's possible to change the favicon directly in VisionX. It's also possible to use the favicon as icon for desktop applications. VisionX will extract the image directly from the favicon. The Menu Button is a simple button which shows a popup menu if you click the button. The component itself also supports a default action, but this is a new feature of JVx' UIPopupMenuButton. The component is available in the elements area. The web elements is a new element area. The elements are preconfigured components like an Insert Button. This Button simply inserts a new record in a table. This web elements will work for desktop applications as well, but are often used in web applications. 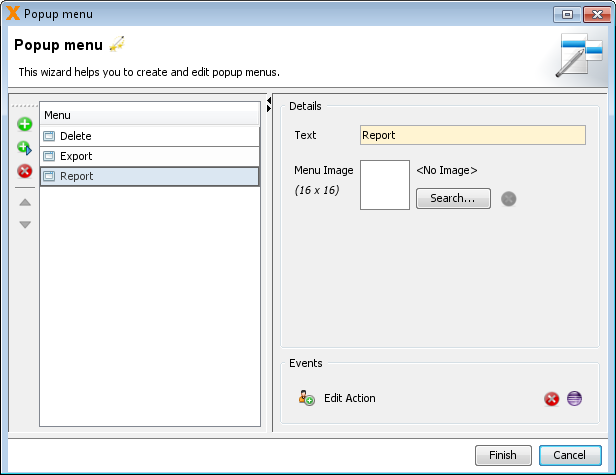 The Table Menu Button is a Menu Button with preconfigured menu items like Delete, Export. 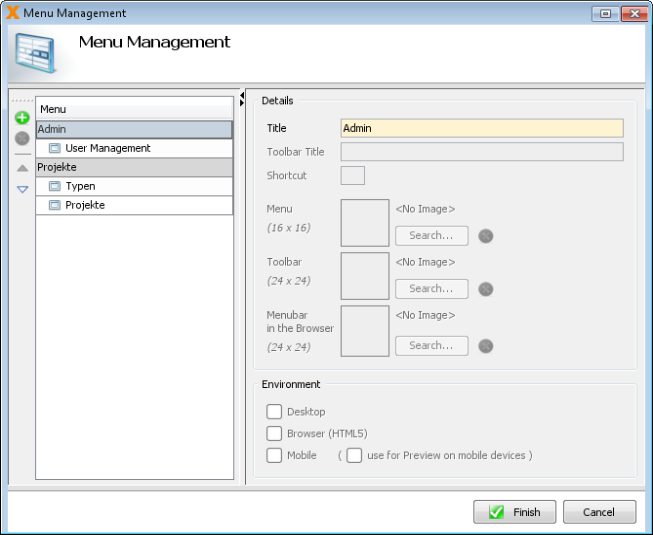 It's also possible to add custom menu items via menu customizer. It's now possible to configure the web menus independent of the desktop menu. Every screen has a menu icon and a toolbar icon. The menu icon will be used for the menubar and the toolbar icon for the toolbar in Desktop applications. The HTML5 application has different layout modes. The standard, the corporation and the legacy mode. The standard mode shows the menu in a sidebar on the left or right of the browser frame. 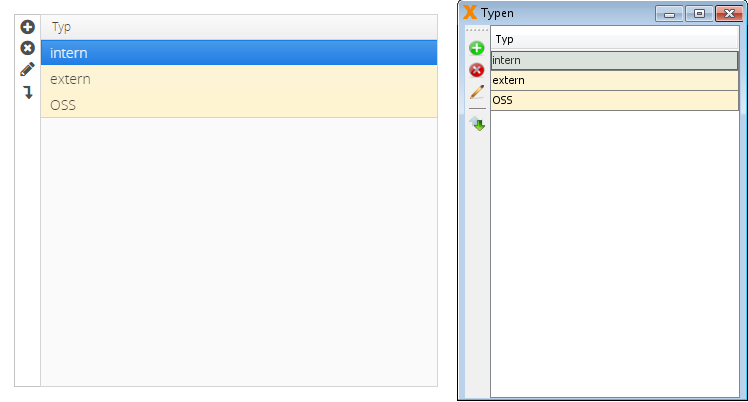 This sidebar was used as toolbar in versions before VisionX 5. 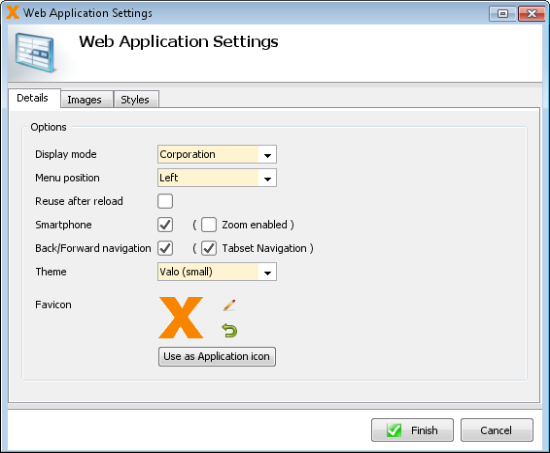 If you did configure a toolbar image, the screen was shown as image in the toolbar of your Desktop application and in the sidebar of your HTML5 application. It wasn't possible to configure an image, only, for the HTML5 sidebar. 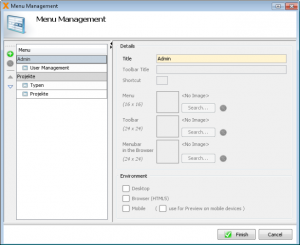 This feature is now available in the menu settings wizard. The toolbar image will be used for the toolbar in the corporation mode, as usual. The Edit Panel now supports a Navigation mode: Single click, Double click and No navigation. 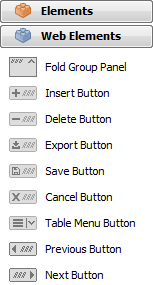 It's also possible to morp an Edit Panel into a Tabset, a simple Panel or a Group Panel. It's now possible to show/hide all columns of a table via customizer. It wasn't nice to click through e.g. 50 columns. Now it's easy to show only 2 columns of e.g. 50 columns. It was possible to map desktop images for e.g. HTML5. 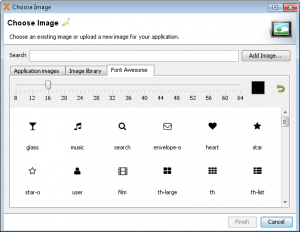 It's better to use simple/flat images in web applications compared to desktop applications. The web style should be or is different to standard desktops. With VisionX 5, we did the default mapping for you and a standard web application will show different standard images. Same application, no changes necessary. Only some image mappings! JVx has FontAwesome support for a while, but this feature wasn't integrated in VisionX. 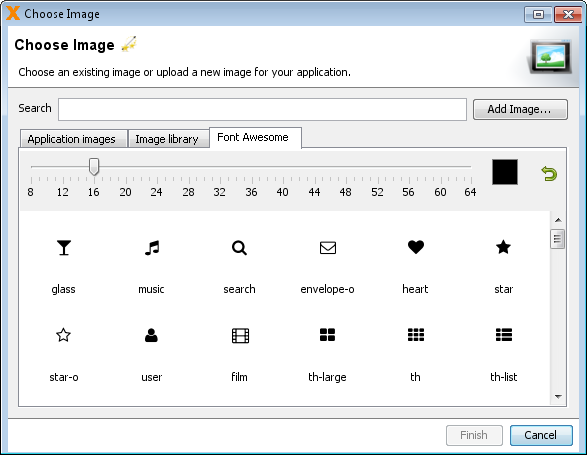 The new image chooser supports FontAwesome. 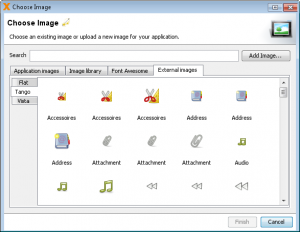 It's now supported to extend VisionX with custom image libraries. We have different commercial AddOns in our Solution store. The libraries will extend the image chooser. It's also possible to integrate your own offline image libraries. We have new tutorials and new Tutorial Applications in our Store. The integrated edit panel has new features like Tab Navigation by Buttons. The edit dialog now has OK and Cancel. It supports single our double click navigation. 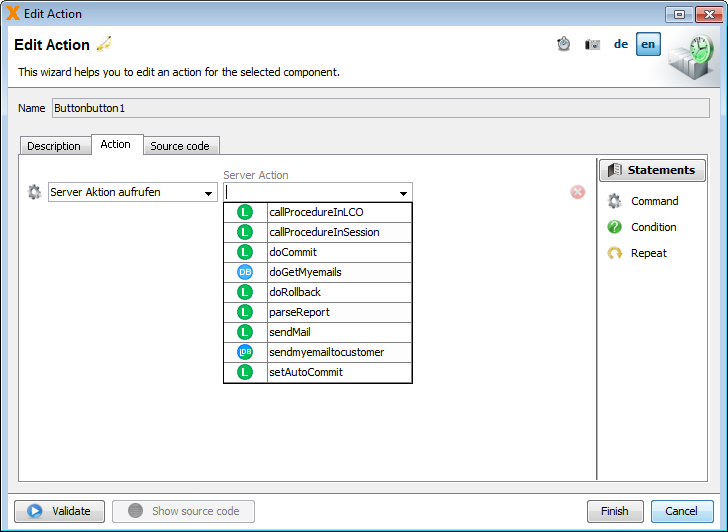 Our action editor now supports (Oracle) database function calls and server-side function calls. 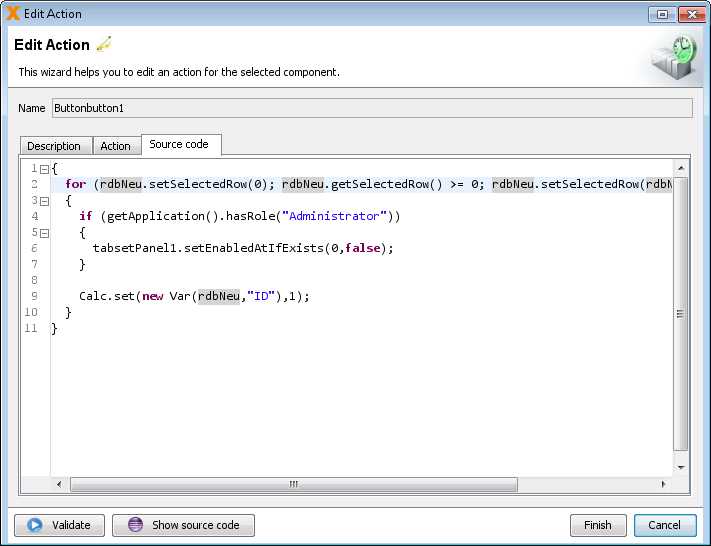 The source code editor now supports syntax highlighting and code folding. It's now possible to change the button border behaviour. The search field now supports Contains and Starts with. We improved the Split Panels and fixed some problems with focus. The split handle is now small. Our HTML5 GUI is now based on Vaadin 8.1 instead of Vaadin 7. With Vaadin 8, the UI is faster and supports all modern AddOns from the Vaadin Directory. We offer a Vaadin AddOn for VisionX to integrate AddOns from the directory. We rewrote the layout mechanism of our HTML5 UI because our Form Layout didn't support all available features. Now it's possible to overlap elements or to work with Anchors directly. The new layout mechanism can be disabled if necessary. In this case, the old mechanism will be used. The online documentation is now available. VisionX 5 still contains Applet and Webstart support, but with VisionX 6 we will remove Applet support because the technology is EOL. The new Version of VisionX will require a new license. Simply ask your sales contact to get a new one. The download area already contains links to VisionX 5 binaries. Please report any problems as usual and have fun with VisionX 5. The support for ANT and JRE6 with Eclipse Oxygen.2 (December 2017). Don't forget the -clean start (read the original article for more details)! If you try to use the bundled ANT with JRE 6, it will fail with an Exception. Download the plugin from here. It works for us - no warranty! We did integrat the RSyntaxTextArea for this. If you want to know how this works, check the documentation. Transactions are an integral mechanism of databases, without them we could hardly ensure data consistency. Well, we could of course, but it would be a lot more work. JDBC has of course support for transactions, but it also supports so called "Savepoints", which we will have a look at today. This might happen in the background if you click a button or do something similar. This example is straightforward but if we start thinking about possible problems we will soon realize that there is a lot of potential for things going wrong. For example if statement #3 would fail we would miss records in the tables B and C. Overall, our data would be in an inconsistent state after that. To make sure that it does not happen, we can define these statements as a single transaction. If one of these statements fail, all changes done by previous statements can be undone and the database will return to the state before we started manipulating it. That is great, because we can now guarantee that even though an error has happened, the data will remain in a consistent state. We could even extend that with additional application logic, for example we insert three records and then we check if the values of all records add up to a certain threshold, if yes, we simply undo the changes. Or if we notice that a constraint has been violated (though, pretty much all databases support constraint definitions in one way or the other). Additionally, transactions are completely isolated from all other connected clients. That means that if we start a transaction and insert a record into table A, all other clients will not see this record until we commit our changes. So the data is never in an inconsistent state, not even temporarily or transiently. Savepoints are sub-transactions within another transaction. It allows to undo parts of an ongoing transaction. If a master record fails to insert, nothing should be inserted. If a detail record fails to insert, the corresponding master record should also not be inserted. We create a savepoint before the insert of the master record, if the insert of the master record fails we rollback the transaction, if the insert of a detail record fails we rollback to the savepoint we created earlier. This allows quite complicated and nested transactions, especially because there is no defined limit to how deep savepoints can be nested. We insert three records, and the second one fails to insert. How should the database behave in such a situation? Turns out that this differs between different database systems. Many databases perform a simple "silent/automatic restore to a previous state", all changes done (if any) of the current statement are undone and the transaction can be treated like the failing statement never happened. With the example above, and assuming that we do not cancel the transaction on an error, the records would be inserted into A and C.
In our tests Oracle, MySQL/MariaDB, H2 and SQLite were all behaving this way. PostgresSQL requires to perform a "manual recovery" from a failed statement. So that once an error occurred during a transaction, the user has to revert to a (manually) set savepoint or rollback the complete transaction. We will go into details on that later. MS SQL on the other hand has a quite different approach. When an error occurs during a transaction, all changes are (automatically) rolled back but the transaction can still be used. So in our example, only the record in C would be inserted. Current transaction is aborted, commands ignored until end of transaction block. Even though that seems tedious, that is not the case. If you have such a requirement you already have central point through which all statements pass before being executed, so this can be implemented easily. In our case it is DBAccess, our main datasource. Because every database interaction has to pass through DBAccess (in one way or the other), we could easily implement such emulation at a low-level and it is automatically available to all users. To be exact, DBAccess has received internal support to wrap all statements in savepoints when configured to do so. This configuration possibility is protected and is currently only used by the PostgresSQL DBAccess extension. It does exactly what it says on the tin and is only active when enabled and automatic commits have been turned off. So this change does have no effect on any other database but PostgreSQL. // Switch off auto commit to use transactions. // This part is optional. As said, we are currently in the process of discussing such possibilities but definitely want to provide such an API at one point. As it turns out, the "special" behavior of PostgreSQL isn't as special as it seems to be. It is a design decision that was taken and that is understandable. Changing this behavior now, 20+ years in, is out of the question as it would require a substantial effort to make sure that this behavior is backwards compatible. The gains from such a change on the other hand would be very little, as it is a quite specialized case in which this behavior matters and the "fix" is rather easy. is a simple to use and highly versatile Open Source wiki software that doesn't require a database. It's a really nice software for your documentation. The default theme isn't super modern, but it works. There are many custom themes available and styling is simple. The really cool thing is the remote API of DokuWiki. It has a XML based RPC interface. Here are some details. After downloading and testing the client, it was clear that it doesn't work. It had a problem with cookie management. I tried to fix the problem in the base lib - aXMLRPC but it was tricky. The problem was the standard Http URL connection. After replacing it with Apache HttpClient, the dokujclient was working without problems. I didn't try to find the root cause of the problem because it wasn't worth the time. It was faster to replace the communication part. Here's a link to our patch and all required libraries (pre-built). We use the remote interface for automatic article updates. It works great! We're happy to announce the release of EPlug 1.2.7. This minor update comes with a big performance improvement! The most notable and important feature of this release is the major speed improvement when checking files. We've revisited how the build pipeline works and could determine quite a few bottlenecks which did not only encumber the build process, but also the live checks of databooks. After fixing these bottlenecks the databook live checks are blazing fast and one does not notice any more that these are active. While reviewing the code, we also saw the possibility for a few more tweaks which we will incorporate into the next major release, to squeeze even more performance out of this. The DataBook view has also received some much needed attention. There is now a toolbar button which allows to sort the columns by their name (instead of their order as returned by the datasource). Additionally the view does no longer flicker when refreshing and will also clear itself when the last editor closes. There is no longer a sleeping EPlug job in the Progress View. The EPlug preferences are now only available on Java projects. If there is no screen lifecycle object, the session object is now used. Removed raw HTML in tooltips. 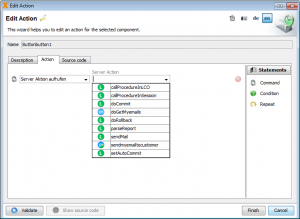 Simply update EPlug via Eclipse! We're happy to announce that JVx 2.7 is available. It's a bigger bugfix release with a small number of new features. Our DBAccess implementation now supports boolean as parameter. Struct support for Oracle DB in procedures and functions. We fixed the problem of session timeouts with long up/downloads. It's now possible to open a work-screen with additional parameters. A new (optional) Parameter class is available. We fixed the problems with internal frame borders.